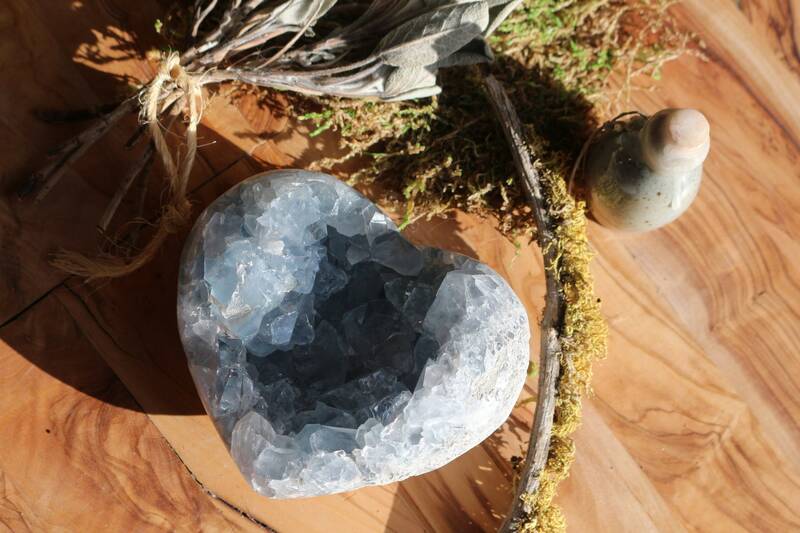 Celestite Heart Shaped Stone ~ Over 2 Pounds! A large Celestite Geode Heart (also known as Celestine), with distinctive points from tiny to large in gorgeous shades of blue with many rainbows throught. So sparkly and happy, a perfect centerpiece for a table, your sacred space or as a gift for your most loved! 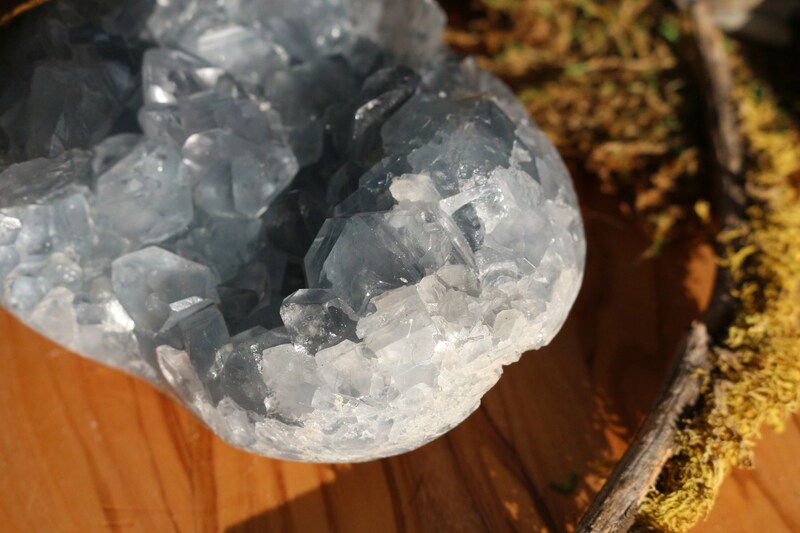 Celestite is very fragile, and should be handled carefully. Do not keep these clusters in direct sunlight, as their color will fade. 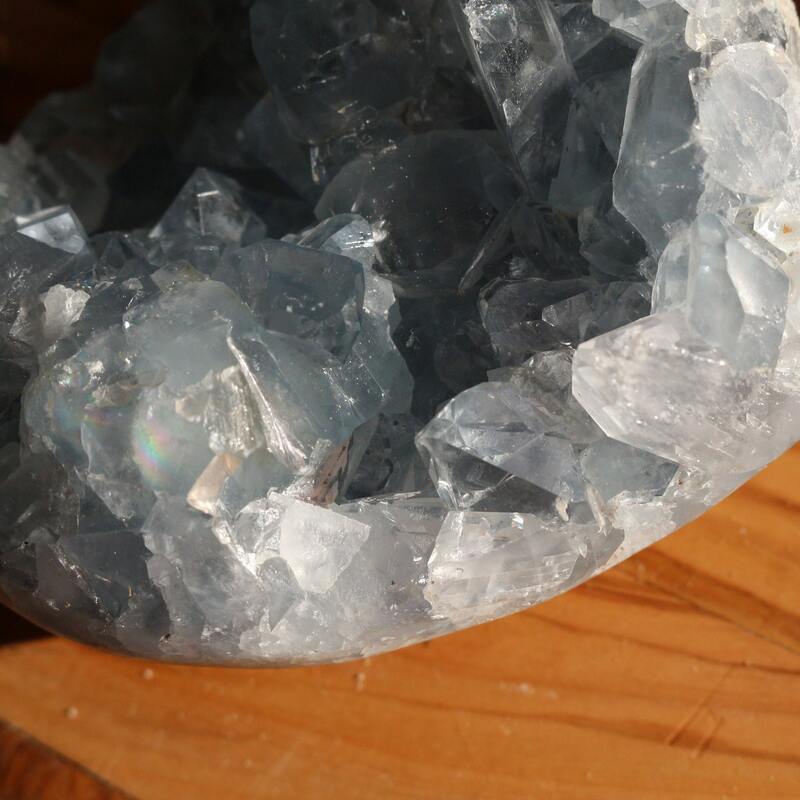 Celestite, also known as Celestine, is thought to be a powerful healing crystal. 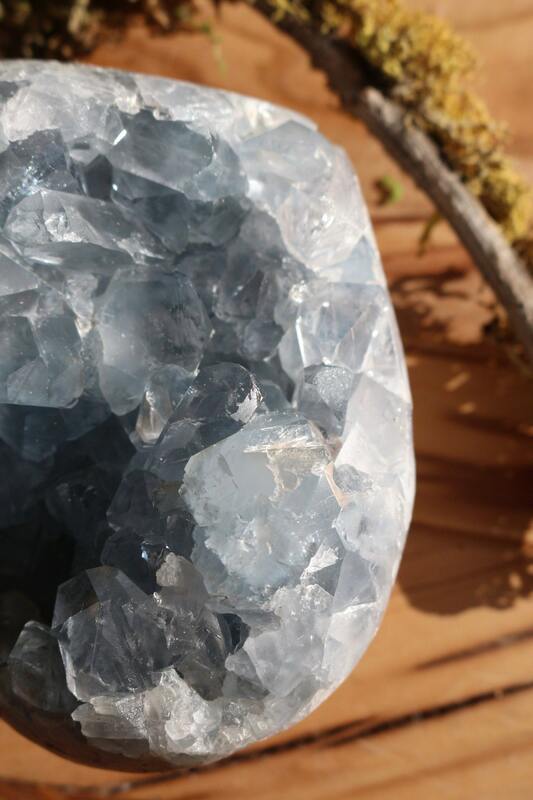 Celestite has been referred to as “teacher for the New Age", as it will connect one with the Angelic realms, allowing for the free-flow of these higher frequencies into the Crown and Third-Eye Chakras, and also down into the Throat Chakra for expression. Bringing mental calm and clarity in the midst of any chaotic circumstance, Celestite can allow one to easily flow through a traumatic period and still come out on top. 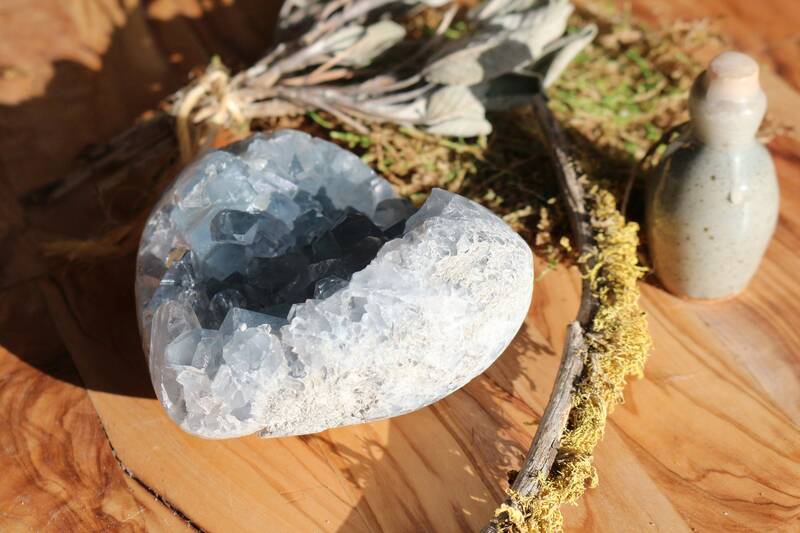 Celestite is associated with the relief of stress, anxiety and obsessive behaviors. It is a perfect piece to carry for those who are singers, actors or speakers, as the energy will alleviate any stage fright or nervousness. Celestite gives courage to those who suffer from agoraphobia (fear of crowds) or public speaking. It can be beneficial for shy or timid children to try new experiences. Celestite brings harmony and balance and will assist the holder in finding and maintaining inner peace. 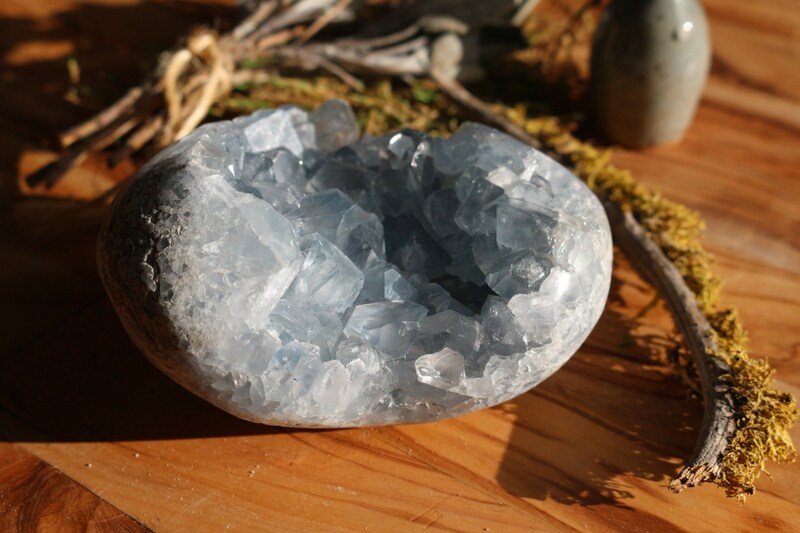 Its ability to heighten divine intuition makes Celestite especially useful for Reiki practice. 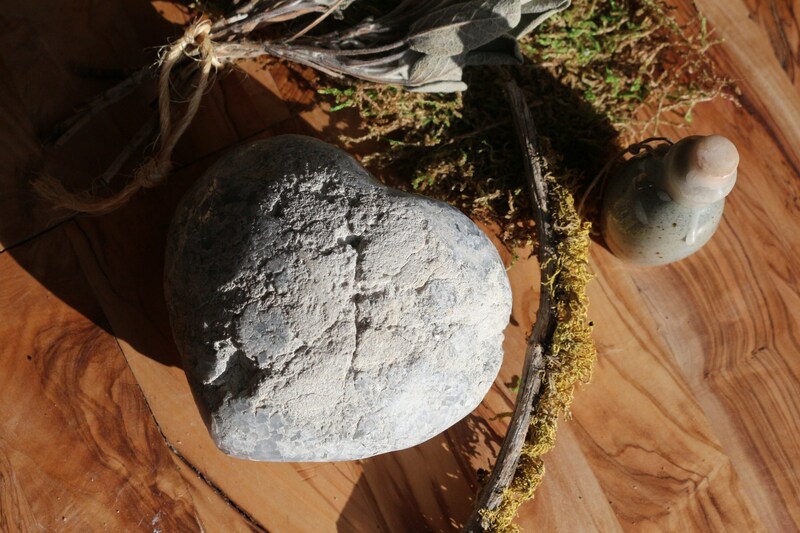 A stone for peace and harmony, Celestite has the potential to bring these qualities into daily living. Celestite is an excellent facilitator for deep states of meditation, helping to calm the mind and open it to communication from the higher realms. 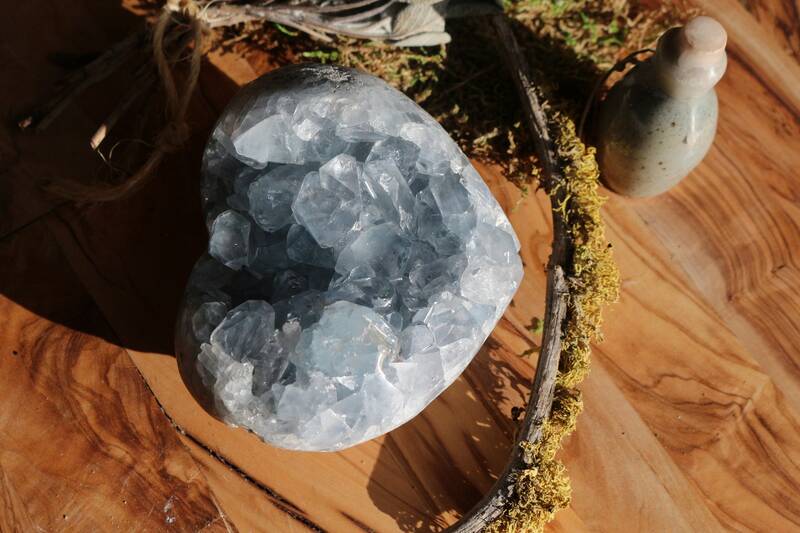 Celestite is a perfect companion to use during dream time. It will assist in recalling not only the dream but also the specific details of the dream. Information imparted during the dream state will also be recalled with perfect clarity. Celestite is associated with the Crown and Third Eye Chakras.